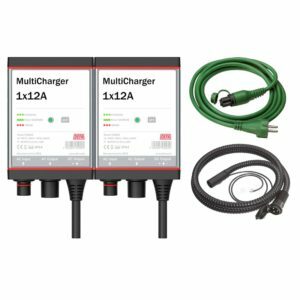 Our MultiCharger family consists of a wide range of high performance chargers for all types of vehicles. They are easy to install thanks to our PlugIn system and can be ordered with a variety of cable lengths. MultiChargers deliver top level performance, with optimized charging cycles and a 92% energy efficiency. They are built to withstand extreme temperatures, moisture, and vibrations. Additionally, all MultiChargers have an immobilizer function that prevents damage to your vehicle if you should forget to unplug the cable. Installing a MultiCharger requires no certification. A wide range of Plug-In cable lengths give you increased flexibility during mounting. The practical Remote Panel lets you monitor the battery from inside the cabin. In addition, our chargers have no fan and make no noise. MultiChargers are compatible with all types of lead/acid batteries. MultiChargers are a part of our module based Plug-In system. You can easily expand your system with our electrical preheating system, app control, tracking and an inverter. With app control, both the driver and the fleet owner can be alerted when the battery needs to be charged. 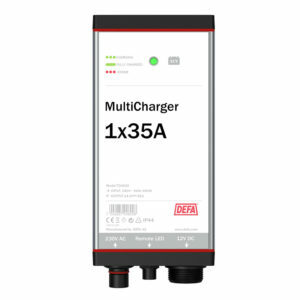 Our new Flex chargers are now available! 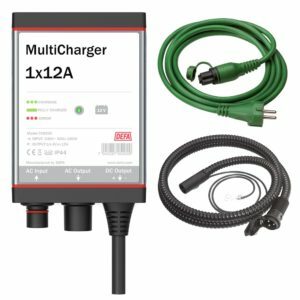 Our new Flex chargers are powerful, compact and come with flexible cables and brackets that makes them much easier to install!